Museum on Kingsland Road in Hoxton/Shoreditch. 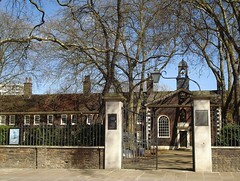 Note: The Geffrye Museum is temporarily closed for refurbishment until early 2020. Almshouses tours and events in the front garden will continue during the closure, but the main building and period garden will remain closed. The museum covers the history of English middle-class living rooms. Although this might sound like a ridiculously specific topic, there's a good deal of depth to the exhibits here, and while it's possible to enjoy the exhibitions simply as attractive curiosities, there are plenty of jumping-off points for more in-depth investigations. The main part of the museum is arranged around eleven period-decorated rooms which trace the evolution of the "living room" concept from a 1630 "hall" to a 1998 loft-conversion studio flat. Handheld storyboards in each period room give details of the furniture, decor, and other items, while supplementary displays in the smaller rooms to the side highlight various themes associated with the collection and give a short overview of relevant contemporary occurrences. The social relevance of the rooms is described, as well as internal and external influences on their design and layout. Partway along the long straight corridor which links the rooms is a small chapel — a remnant of the 18th century almshouses that were originally on the site — and a reading room with books for adults ("Medieval London Houses", "Pictorial Dictionary of British 19th Century Furniture Design") and children. As well as the period rooms, the museum site includes a fully restored almshouse (timed entry only, on certain Wednesdays and Saturdays) and a number of period gardens (open April to October only). Children are generally well catered for; a children's trail runs through the museum, with each room including a couple of questions to answer, such as "Can you see any birds and flowers in this room?" School trips are welcomed — on our visit, we ended up missing one of the rooms because the viewing area was filled with a flock of primary school children all sitting crosslegged in a line in front of a staff member who was explaining various bits and pieces to them. There are "art rooms" for practical activities on the lower ground level, and the museum runs a series of events aimed at children. Photography is permitted for personal use (no tripods though). There's a cafe and a shop, the latter including a decent collection of local history books. The (free-of-charge) cloakroom has bag lockers and a rather cunningly-designed coat security system involving a lockable cable that runs through one sleeve. Entry to the museum is also free. Accessibility: Ramp up to get in, and level access to the main floor including shop and cafe once you're in. The corridor running alongside the main exhibits is not overly wide, but there are plenty of passing places. The museum offers sign-interpreted talks, tours, and workshops, as well as talks and handling sessions for blind and partially sighted visitors. More info on the museum's access page. Last visited by Kake and Eliza, March 2010. Last edited 2019-02-06 08:33:06 (version 8; diff). List all versions. Page last edited 2019-02-06 08:33:06 (version 8).